Throughout the proccess of developing Into the Unkown I've been resistant to the idea of splitting the rules set into staggered releases the way B/X and BECMI did. The 5e SRD has rules going all the way to level 20 for free, why impose limitations on what should be in ItU's ruleset when the material for higher is already there and just need some adaption and editing? If it's there, put it in. One rules set to rule them or or staggered sets for different tiers of play? I am getting close enough to the finishing line now that I did a projected page count, minus cover, toc and formalia (but including internal artwork), for the player booklets. So basically 150 pages of player material. For comparison, the equivalent chapters in the player's handbook is 290 pages. But 150 pages is still a very high number to me. The equivalent player material across B/X is 55 pages. So I've been giving some thought to letting the main rules set be "Basic and Expert rules", running up to 10th level (11th level is where 5e kicks off into superhero mode) and following up later with a "Companion" dedicated to high level play. The page count doesn't really improve that much. Intro and character creation is reduced by 6-7 pages, spells reduced by 30 pages. Even if I do a trim of the equipment section, it's over 100 pages. But at least it's thereabouts. More importantly, I think there are good reasons to split it up. In the OSR group on Google+, +Charlie Mason recently asked about the highest level people usually played to. Out of 160 votes, a whopping 79% capped at 11th level. In other words, a game covering levels 1-10 is a fully self-contained game for the vast majority of campaigns. The more I've been thinking on this, the more I am realising that high level play really is a different beast to the regular game. And putting it all in the same volume doesn't do justice to that fact. A 1-10 rules set is focused - dungeon and wilderness exploration. check. You might save the kingdom, but you're not a kingmaker just yet. Making the rules set focused is also one of those things that should make the game more accessible to dive into. 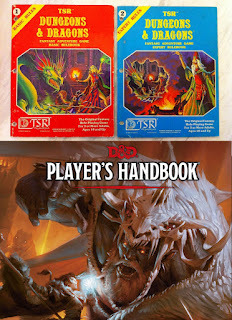 Above that, whether it is the domain game of older editions or just the high level adventuring of later editions, the tone and setting changes. A companion volume (which I'd also stack with various 'advanced' and optional rules for class building, etc) has a much better shot of properly addressing gameplay at levels 11+. I'd love some opinion on this though. Maybe I am barking up the wrong tree? In other news, as the player's section is getting closer to release, I reckon I will release two versions. The three booklets, optimised for table use and a singular "Player's Guide" for those who prefer to have it in one volume. PS. To follow up on my save entry the other day - After much deliberation, I'm going with "all saves add proficiency bonus and attribute modifier". It's clean, the simplicity is to die for and the numbers make good sense. Thanks S&W.